Clipping coupons is a great way to purchase discounted food and household items. Using coupons does not have to be time-consuming or create unwanted paper clutter. Planning in advance how the coupons will be clipped and stored will save time and energy. Here are some tips on how to use and properly clip coupons. Fear of missing out on a great deal is the reason most people do take time to clip out all of the coupons. One time-saving alternative is to clip out all of the coupons that the family will use. Clip the coupons for all edible food items and keep products that are not used in the insert. For example, if there are no diabetic members of the family, leave the diabetic related coupons inside of the insert. Coupon inserts always have several pages. When purchasing more than one set of Sunday circulars do not clip every single coupon. Take a few minutes and separate each page. Simply open the circular and stack the inserts that are the same. Stack the coupons on a flat surface. Pile as many similar coupon inserts together as possible. Use a paperclip for extra holding power if it is challenging to hold the stack of coupons together. 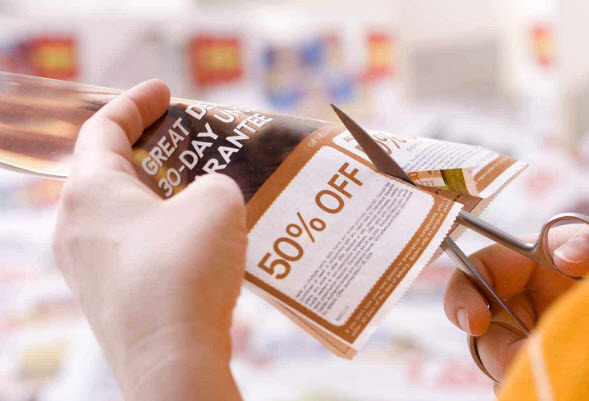 Use a craft blade cutter or sharp kitchen scissors to cut through the stack of coupons. Immediately after clipping one set of coupons, place them into a coupon binder. Put the coupons that will not be used in a shoe box with a lid, or in a file specifically for coupons. Visit coupon forums and coupon blogs to stay up to date on free deals. These are deals that are free or deeply discounted when using a coupon. Coupon forums are a great way to find out about unadvertised store specials from local or national grocery stores. Search for bloggers that shop at stores available locally. When there are deals for free products take advantage of them. If the necessary coupons are filed away, grab them from the coupon file and only clip the necessary coupons. Free items can be donated to homeless shelters, organizations that help victims of domestic violence, or given to friends or family. Ensure coupon savings by clipping coupons in stacks, immediately place usable coupons in a coupon binder, and placing the remaining inserts in files. With practice, it is easy to save $100 and more each month using coupons. Use these tips to start saving money on groceries and nonfood household items. Error: Error validating access token: Session has expired on Friday, 12-Apr-19 14:10:09 PDT. The current time is Sunday, 21-Apr-19 11:12:21 PDT.